Heat oven to 375°F. To make Cups, brush one side of 1 wonton skin with olive oil. With bottom of small drinking glass, press wonton skin, oil side down, into ungreased regular-size muffin cup. Repeat with remaining wonton skins. Bake 7 to 10 minutes or until brown. Remove from muffin cups to cooling rack. In 10-inch skillet, melt butter over medium heat. Add ramen noodles, almonds, sunflower nuts and sesame seed; cook, stirring frequently, until brown. Remove from skillet to small bowl; cool completely. Shred cabbage; place in large bowl. Add green onions to cooled noodle mixture; stir. Sprinkle over cabbage. In small bowl, beat sugar and vinegar with whisk until dissolved. Beat in soy sauce. Add oil; beat until well combined. Add Dressing to Salad; toss. Fill cooled cups with salad. Serve immediately. The dressing can be made ahead of time; just make sure to mix it before pouring it on the salad. 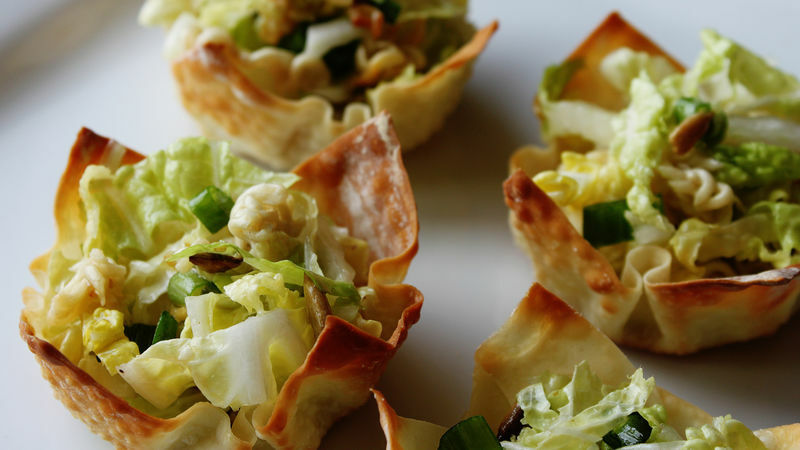 Wonton cups can be made ahead of time and then filled with the salad just before serving. Shredded chicken can be added to make this a main-dish dinner salad.